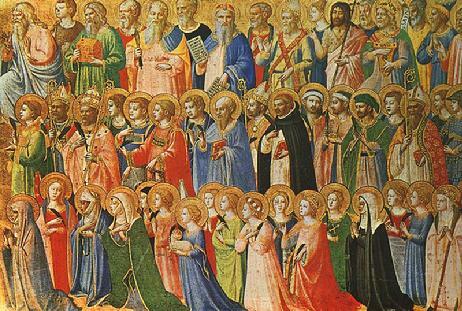 Today's feast celebrates our communion with saints in heaven and on earth. But what about the individual desire to become a saint? A young Thomas Merton walks down Sixth Avenue with his friend Lax on their way to Greenwich village. "The street was all torn up and trenched and banked high with dirt and marked out with red lanterns where they were digging the subway, and we picked our way along the fronts of the dark little stores on our way to Greenwich Village." Merton writes that the moment "turned out to be historical, as far as my own soul is concerned." Lax puts into Merton’s mind the unexpected thought that you could desire to be a saint. Can I be a saint? (meditation one). What is a saint? (meditation two). What would saints do in heaven? (meditation three). Have a very happy All Saints Feast. What do you want to be, anyway? The explanation I gave was lame enough, and expressed my confusion, and betrayed how little I had really thought about it at all. “By wanting to,” said Lax simply. When he woke up it was dawn. He woke with a huge feeling of hope which suddenly and completely left him at the first sight of the prison yard. It was the morning of his death. He crouched on the floor with the empty brandy-flask in his hand trying to remember an Act of Contrition. 'O God, I am sorry and beg pardon for all my sins...crucified...worthy of thy dreadful punishments.' He was confused, his mind was on other things: it was not the good death for which one always prayed. He caught sight of his own shadow on the cell wall; it had a look of surprise and grotesque unimportance. What a fool he had been to think that he was strong enough to stay when others fled. What an impossible fellow I am, he thought, and how useless. I have done nothing for anybody. I might just as well have never lived. His parents were dead- soon he wouldn't even be a memory - perhaps after all he was not at the moment afraid of damnation - even the fear of pain was in the background. He felt only an immense disappointment because he had to go to God empty-handed, with nothing done at all. It seemed to him, a that moment, that it would have been quite easy to have been a saint. It would only have needed a little self-restraint and a little courage. he felt like someone who has missed happiness by seconds at an appointed place. He knew now that at the end there was only one thing that counted - to be a saint. 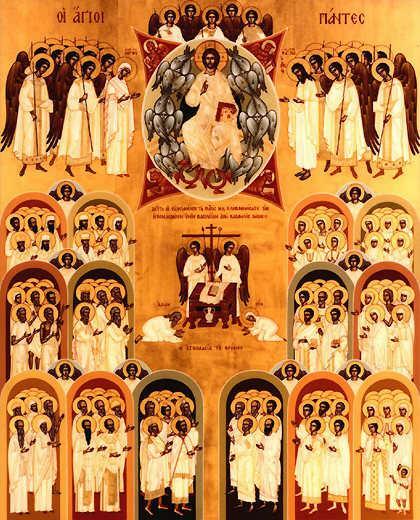 The glorious company of apostles praise you; the noble fellowship of prophets praise you; the white-robed army of martyrs praise you; throughout the world the holy Church acclaims you: O blessed Trinity, one only God. 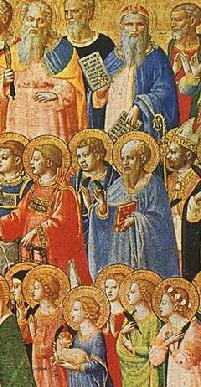 -Antiphon on the Benedictus, Lauds at All Saints. (the phrase comes from the Te Deum). What is a saint? A saint is someone who has achieved a remote human possibility. It is impossible to say what that possibility is. I think it has something to do with the energy of love. Contact with this energy results in the exercise of a kind of balance in the chaos of existence. A saint does not dissolve the chaos; if he did the world would have changed long ago. I do not think that a saint dissolves the chaos even for himself, for there is something arrogant and warlike in the notion of a man setting the universe in order. It is a kind of balance that is his glory. He rides the drifts like an escaped ski. His course is a caress of the hill. His track is a drawing of the snow in a moment of its particular arrangement with wind and rock. Something in him so loves the world that he gives himself to the laws of gravity and chance. Far from flying with the angels, he traces with the fidelity of a seismograph needle the state of the solid bloody landscape. His house is dangerous and finite, but he is at home in the world. He can love the shapes of human beings, the fine and twisted shapes of the heart. It is good to have among us such men, such balancing monsters of love. There's a story of a good man who dies and goes to heaven, and who is welcomed at the pearly gates, which are thrown open for him to enter. He goes through them in a daze of bliss, because it is everything he has been taught, golden streets, milk and alabaster and honey and golden harps. He wanders the streets lost in happiness, until after a while he realizes that he is all alone; he hasn't seen anybody at all. He walks and walks, and he sees nobody. So he goes back to the gates, and he asks, "Peter?" "Oh, yes, my son. Don't you like it?" "Oh, it's just wonderful! But where is everybody? Where are the prophets? Where is the Holy Family? Where are the saints?" Peter looks at him kindly. "Oh, them? They're all down in hell, ministering to the damned. If you'd like to join them, I'll show you the way." The saints have no need of honor from us; neither does our devotion add the slightest thing to what is theirs. Clearly, if we venerate their memory, it serves us, not them. But I tell you, when I think of them, I feel myself inflamed by tremendous yearning. The footprints of your virtue and your power. it please you give me peace. Who is there? What do you want of me? How can I be for you, be toward you? Our soul is that objectively existing opening in our subjective life that knows about God and goodness and evil, about the transcendent and its reach into the ordinary, into our daily life, into everything. The soul registers with special pleasure our experience of mystery and its source, and wants above all else to know better that source, that ultimate other in our lives. Soul is willingness, even desire, to correspond to that other as it makes itself known to us. The soul’s imaginings dwell on who this other is, who this God is that comes to us. Soul asks, Who is there? What do you want of me? How can I be for you, be toward you?